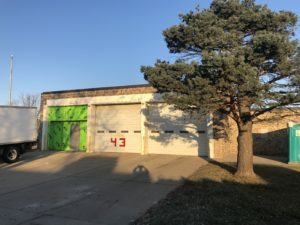 Last summer, a fire started at station #43 of the Omaha Fire Department. It may seem ironic, but it goes to show that anyone is susceptible to an accidental fire – even firefighters. The fire started in the kitchen while most of the fire crew was out on an emergency, and it caused significant damage to the kitchen and living quarters of the station. Because of work we have done on previous projects, the City of Omaha contacted Prairie Construction for the immediate need of gutting the electrical system to make the station safe. After ensuring the structure was safe, we began phase 1 of the remodel of station #43. This involved constructing temporary sleeping quarters in the apparatus bay so normal operations could resume from the station. The firefighters were fortunate to find temporary housing at the Omaha Police Department locate right behind the fire station during this phase of the project. Phase 2, which is expected to be completed in early spring, involves a remodel of the living quarters. The original design of the station included open air sleeping quarters, and individual sleeping quarters will be incorporated into the remodel, as well as updated living and kitchen area. We appreciate the opportunity to give back to the Omaha Fire Department and the firefighters who help our community every day. Check back for an update when this project is completed!